The Independent National Electoral Commission (INEC) may ban the use of smart phones at polling units as the 2019 general election draws near. 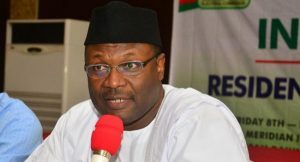 This was made known by the chairman of the electoral body, Mahmood Yakubu, on Thursday, at an Election Dialogue Series organised by a civil society organisation, YIAGA’s WatchingTheVote, at Sheraton Hotels in Abuja. Mr Yakubu said the move was to curb vote buying during an election. He explained that as voters collect the ballot papers to cast their votes, their mobile devices will be carted away from them because those who carry mobile phones along to polling units normally use them to take pictures of the ballot papers as evidence to the vote buyers. ”The commission would try and ban the use of some devices that aid vote buying on election day such as mobile phones,” Mr Yakubu said while addressing the audience. ”It is all widespread that for those who have smart phones, they go into the voting cubicles with there smart phones, thumbprint the ballot paper, take a picture with the ballot paper, fold it and drop it into the box, and later show it to the person who asked them to vote to see evidence that they have voted for there candidate. ”But I also think that the political parties may be for a shocker because there are also smart guys in Nigeria that would snap and send to others through whatsapp and one ballot paper may be claimed by hundreds of people. The INEC boss also spoke about the violations that occur before the elections whereby cash electronic transactions were made to buy votes, adding that the commission was looking forward to working with institutions to address the menace.